Our Confirmation program seeks to nurture and cultivate the faith journey our youth are taking and strives to mature their faith formation. Our goal is to provide skills that will allow them to follow their spiritual journey as well as offer programs that will broaden their community outreach. Confirmation classes are held twice a month on the second and fourth Sunday of each month. Classes are taught by Emma Nathanson, Director of Youth Ministry, and Jeanne Martin, Deacon, with assistance from Rev. Lauri, using the UCC Conference Guide “Affirming Faith” as the curriculum. A confirmand is a person who is receiving instruction in the fundamentals of our Christian faith and who will choose to confirm his/her baptism by joining the church. Confirmation is the rite in which individuals declare their mature commitment to Christ. At baptism, vows were taken for the confirmands by their parents and by the church community. All agreed to be responsible for seeing that the children were raised in the Christian faith. At confirmation, the candidates themselves assume responsibility for living out their baptismal vows. Confirmation marks the moment in which one begins the process of living the Christian life no longer as a child, but as an adult. What is our current Confirmation Class up to? Attended the 2016 UCC New York State Youth Event from 3/4- 3/6 at Painted Post, NY. This year’s event theme, “Heart over Hype” looked at ways to hear God's Voice over the hype of society. Youth had a chance to meet, learn, have fun, and worship together. Youth Group “Art Nights” held every Friday evening allow our Confirmation aged youth to enrich their involvement in the church through artful expression. Confirmation students are “on call” on a rotational basis to assist with Sunday school and the younger children downstairs during worship when needed. Confirmands were asked to formulate an individual UCC “Statement of Faith” providing their thoughts on being a member of the United Church of Christ community. 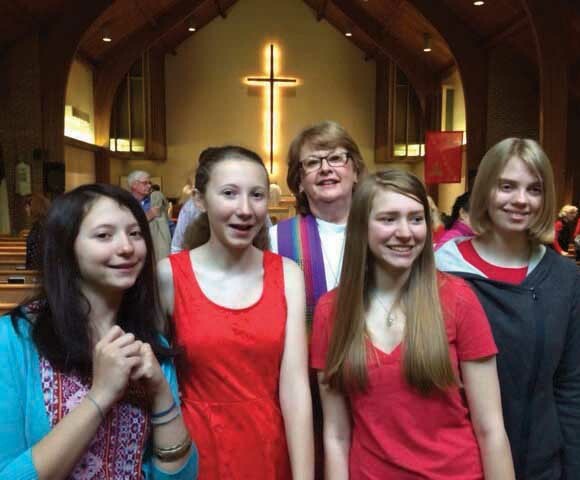 On Pentecost Sunday, May 15th, we celebrated the Rite of Confirmation as our confirmands continue their faith journey as members of the First Congregational UCC of Haworth. The joyful spirit filled the sanctuary with performances by our Children’s Choir and our Confirmation Teen Ensemble.